Awaken is an awesome, inventive read. Kacvinsky paints an interesting picture of fifty years into the future, where society is practically enslaved in their home, letting their technological devices do their living for them. Maddie doesn't agree with this living, but her past behavior has taught her to go along with it and keep her head down. Her relationship with Justin allows her to open up about her beliefs and begin to express her true feelings. She grapples with wanting to be an adult and break free of her parents' influence while still maintaining their love and approval, which is a fine, nearly impossible balance that Kacvinsky demonstrates well. Maddie's relationship with her parents is complex, and a very interesting element to the novel; her father is strict and unyielding, unable to forgive Maddie for having an opinion that differs from his, but her mother subtly takes Maddie's side, even if she never speaks up. Justin and Maddie's relationship isn't without its own troubles as well--Justin is smart and attractive, but has issues of his own that prevent him from being completely honest with Maddie from the beginning. Kacvinsky is an astute, creative, and smart writer, and Awaken is very timely novel that will make teens think critically about the role of technology in their lives and just how important it really is. 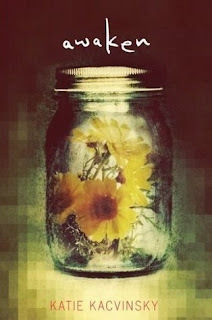 Cover Comments: I like the jar with the flower and the pixelated look of the image. 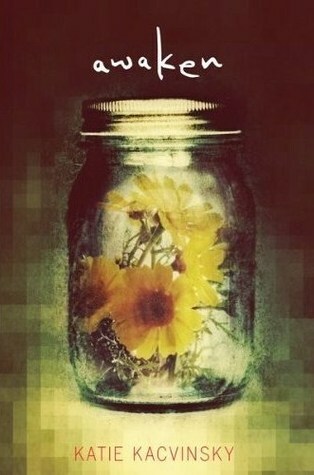 It's very fitting with the technology and the themes of nature found in the book. I also think that the colors and lighting at pretty cool. it creates an image that is a bit edgy, and bit foreboding, which matches the book well! Also, stay tuned for my interview with Katie Kacvinsky on Friday! Looks great!! I really want to read it and it was on netgalley but I totally missed it u.u I´ve heard very good things bout it. Nice Review!